If you want to make money taking pictures, photography is not the only skill you need to master. In fact, this infographic by the International Society of Professional Wedding Photographers suggests that you will spend less time taking photos than editing them. There seems to be a lot of misconceptions regarding what wedding photographers actually do all week. It’s perfectly understandable, after all, the only time most people see us working is at the wedding. So I thought it would be interesting to survey wedding photographers and discover what they really do besides take pictures every weekend. Hopefully it will help clear up some misconceptions and give some insight into what goes on behind the scenes after we leave the reception. It's not just wedding photographers. 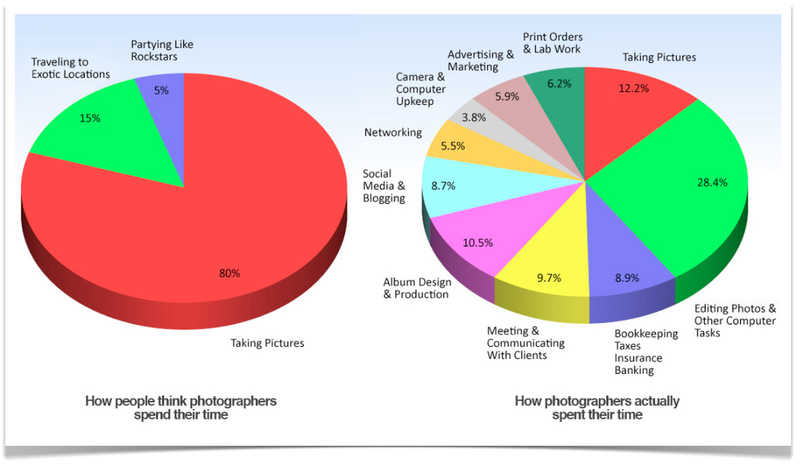 I'd say the chart is still fairly accurate for those who focus on other types photography -- even teaching. Knowing that, as you consider preparing for a career in photography, also plan how you will develop all the other related skills. Your success will depend on a lot more than taking pretty pictures.